Five Teams Vie for RBC Cup - College Hockey, Inc.
41 Division I commits in contention for Canadian championship. 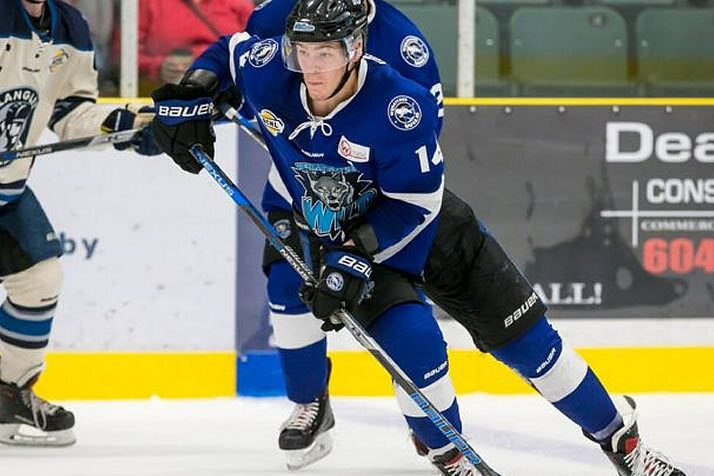 North Dakota commit Jasper Weatherby leads Wenatchee into the RBC Cup (Photo by Garrett James Photography). Five teams from the CJHL will converge on Chilliwack, B.C., to compete for the RBC Cup, Canada’s national Junior A championship, beginning this Saturday. The Chilliwack Chiefs (BCHL), Ottawa Jr. Senators (CCHL), Steinbach Pistons (MJHL), Wellington Dukes (OJHL) and Wenatchee Wild (BCHL) have 41 Division I commits between them, representing 28 schools. The two BCHL representatives – Wenatchee (13) and Chilliwack (12) – lead the field in commitments on their rosters. Ottawa and Wellington each have six Division I commits, while Steinbach features four. Merrimack, with two commits on Wellington and another on Wenatchee, is the only team with more than two recruits in the tournament. Canisius, Holy Cross, Lake Superior State, Merrimack, Michigan State, Minnesota State, North Dakota, Princeton, Rensselaer, RIT, Robert Morris and Western Michigan all have multiple recruits in the field. The tournament features a round-robin preliminary round, beginning May 12, and culminates in the championship game May 20. The preliminary and semifinal games will be streamed on HockeyCanada.ca, while the championship game is televised on TSN in Canada. Chilliwack is led by head coach Brian Maloney, a former Michigan State standout, and the offensive duo of Will Calverley (RIT) and Tommy Lee (Rensselaer). The Chiefs qualified for the event as the host team. Ottawa won the CCHL championship and the Fred Page Cup, which features teams from the CCHL, LHJQ and MHL. Future Lake Superior State teammates Pierre-Luc Veillette and Owen Guy were two of the Senators’ top three scorers in the regular season. Steinbach won the Anavet Cup series against the SJHL’s Nipawin Hawks to advance to the RBC Cup. The Pistons feature future Western Michigan teammates Drew Worrad (the MJHL playoff MVP) and Riese Gaber, plus Maine commit Matthew Thiessen in goal. Wellington won the OJHL and the Dudley Hewitt Cup tournament against the SIJHL and NOJHL champions. Canisius commit Mitchell Martan led the Dukes in regular-season scoring, while NHL Draft prospect Declan Carlile is one of two Merrimack commits on the roster. Wenatchee features three players ranked by NHL Central Scouting for the 2018 NHL Draft: Slava Demin (Denver), Jasper Weatherby (North Dakota) and Samuel Morton (Union). The Wild won the BCHL championship and the best-of-seven Doyle Cup against the AJHL’s Spruce Grove Saints. Weatherby led the league in regular-season and playoff scoring. The Cobourg Cougars won the 2017 RBC Cup, which featured tournament MVP and current Massachusetts defenseman Cale Makar.